In the early Byzantine World, there were innumerable Christian relics and shrines to search out and see, so the flow of pilgrims eastward from Italy rose sharply. With stubborn determination and for months on end, they trudged the bandit-ridden roads that linked eastern towns to the hundreds of monasteries and hallowed places that lay along their route to Jerusalem. 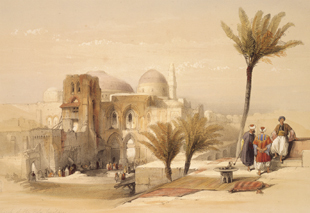 Once in the Holy City itself, however, they could walk in comfort to its two main shrines—the supposed site of the Crucifixion (Golgotha) and the reputed burial place of Jesus—both of which were housed in the Church of the Holy Sepulcher. At both these places any pilgrim, fully in awe of his surroundings, could ask for a small bottle or juglet of sacred oil; something to be taken home and cherished as the most important memento of their travels. 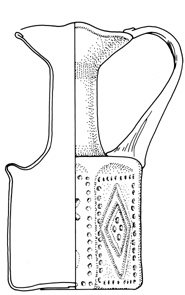 Barag, D., 1970: “Glass Pilgrim Vessels from Jerusalem: Part I,” Journal of Glass Studies 12, 35-63. Barag, D., 1971: “Glass Pilgrim Vessels from Jerusalem: Parts II & III,” Journal of Glass Studies 13, 45-63. Fleming, S.J., 1999: Roman Glass: Reflections on Cultural Change, 125-130 (Philadelphia: University of Pennsylvania Museum). Harden, D.B., 1987: Glass of the Caesars, 174-177 (Milan: Olivetti). 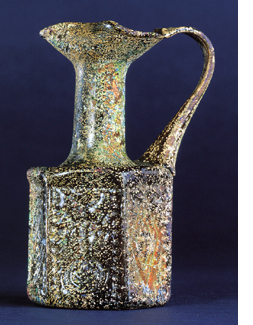 Stern, E.M., 1995: Roman Mold-Blown Glass, 253-269 (Rome: "L'Erma" di Bretscneider).